Making this horse genetics website has been a massive on-going task, but great fun. Horse genetics research is moving apace, so that I'm ever catching up on the updating. The genuine interest and the enthusiastic help I've got has made the task, and the late nights, so much easier and pleasanter. Being a professional geneticist is fun at times, and always interesting. A few years ago though, I decided it was time to start changing my life so that I didn't spend all of it working. Now I have a son, 3 horses (see the about me page) and a horse genetics website! When I started out I'd already made a website on hamster genetics (Hammy's Hoard). I'd put a whole lot of work in. I'd taken huge numbers of photos, at home and shows, and spent hours and hours on research and careful presentation. But back then I still knew little about the web. A few of the stars of Hammy's Hoard. They were also ever popular exhibits in the genetics classes! I made the site on a free (and very easy to use) software package. When the software people started charging for the web-hosting I didn't really mind, but I just couldn't work out how to actually pay them on-line. I thought I'd done it, but then I got an email to say I hadn't. I tried to contact the company to ask how to, and I got no responses at all. Despite attempts to find out how to comply the company selling the web-hosting were absolutely no help whatsoever, and my site got removed. I was a bit upset, and also annoyed. I've still got all the texts and photos somewhere, but I can never recreate Hammy's Hoard just as it was! So this time around I was out to get the best web-hosting package I could find, and I determined that this would be the first research I did! What I found out was that making a horse genetics website was really going to be the comparitively easy bit! Helping people to find the site, and then persuading them to visit and return, now they are the real tasks. Good grief, there was so much to consider and learn, I might never actually get around to the horse genetics! After some searching I found a package that helped to take me step-by-step through all the essential steps of making a successful website, while automating a whole lot of stuff I really didn't want to have to do myself. That package is Site Build It! and is the one I use to this day. I absolutely love SBI! For me, it is helping to turn my dream of a different life into a reality. I've seen how it has given financial independence to others, doing just what they love, and thats where I'm headed! I've now started a second site, and recommended SBI! to my mum and brother, who're building a business site with it. For anyone wanting to start a hobby or business site, and especially for those who want to combine the two, I can't reccommend SBI! more highly (see the links at the bottom of the page). The other possibilities I looked at don't even come close! For horsey people with Broadband you should take a look at the link that follows. Scroll down the page to the 7th video link down: The Magic In SBI! Is... They Released The Magic In Us! by Josephine, and watch her beautiful and so very talented Andalusian horses (and trainer!). It is truly inspirational! Making a horse genetics website has been an experience! It has entailed lots of reading, lots of talking to enthusiasts and professionals, online and off, and lots of asking for photos, which have always been shared with generous enthusiasm. Assimilating everything has been fun, but not always completely straight forward! It's surprising that a subject such as horse genetics can sometimes engender rather passionate debate. (On a couple of occassions somewhat surprisingly indignant or downright grumpy debate, when I had opinions being shot at me from all sides. I hope I've sorted through conflicting views and evidence without leaving too many holes!) The little grey cells have certainly had a good work-out! And now here I am! I've still not got around to everything Solo Build It! 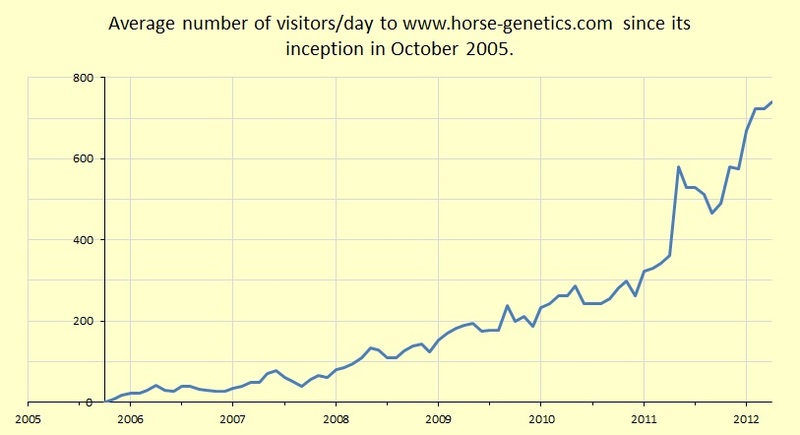 reccommend (I'll get there eventually), but I have a horse genetics site I'm not unproud of. It gets an average of over 700 visitors a day, and, as I write, is at the number one and two spot in the Google search engine for it's main keyword. You can see from the chart above how the average number of visitors per day has risen since I first started making this website in 2005. I'll probably never be quite up-to-date on everything, but I do my best! And through it all I've had huge fun and learnt a ton, and met a whole bunch of really great people, with a whole bunch of superb horses. Note for anyone who wants a website or home business: Anyone wanting to know more about building a successful hobby and/or business website should visit the links below. I am normally very reticent to endorse anything at all unless I absolutely believe in it, because I just can't do it! In this case I feel completely happy about it, because I know it's working for me. I would never have otherwise recommended it to family and friends (whose success is, of course, more important to me than anyone elses). I know people who've employed people to build their sites and it seems that they are never entirely satisfied, and often frustrated that they are then not in control of content, layout and updating. I myself have used other packages and software I've not been happy with. In one case I lost a whole site due to lack of proper communication with the web-hosts. If you're gonna do something, you gotta start out right! It can take years for you to learn how to promote a website to score in the search engines. Along the way you could spend a lot of money on learning how, buying software, services, add-ons and "how to" guides - many people do, and still their websites get almost no-where. Solo Build It! is not just a web-host, it's a complete blueprint for building an online website, and/or web-business, using the best possible practices. I whole-heartedly recommend you using it, sticking completely with it and ignoring the "too good to be true" offers of short-cuts to millions (which mostly just take away what you have and don't deliver on their promises). The complete site about SBI!. The "landing page" starts by explaining the "It!" in Solo Build It! Amongst other things there are Case Studies and explanations of the SBI! process. The SiteSell Homepage - an overall introduction to SBI!